I've written several posts about the gravity of the "teen journey" and the role of parenting during this amazingly difficult time during a youth's development. The implications - who the child turns out to be when he or she becomes an adult. 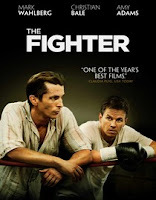 The drama centers around Micky Ward (Mark Wahlberg) and older brother Dicky Eklund (Christian Bale), whose claim to fame is that he once knocked down boxing great Sugar Ray Robinson. And their family, whose center is the dominating mother (Melissa Leo) who serves as Micky's manager. For me, this is a portrait of what happens when young people are raised in a dysfunctional family, in which there is love, but instead of effective parenting - manipulation and exploitation. The result is hard to watch. The adults who survived this smothering childhood are mentally and emotionally crippled. Older brother Dicky is a crack addict - one of the worst losers I've ever seen depicted in a movie. Between him and his mother, rising boxer Micky remains dependent, limited and victimized. Will Micky free himself from this situation to realize his potential as a man and a boxer? How the story plays out is the movie's drama. It's a sobering illustration of how young people can be damaged for life when uninformed parents do all the wrong things during the years when the window of opportunity for developing the neural pathways for critical thinking opens and closes. Denny, I agree that parenting makes all the difference for developing leadership skills and personal strength. I loved the movie, too. Christian Bale did such a good job. I think we've all met someone like Dicky in our lives at one time or another.